For those who know me know that I LOVE shoes. I love (typically any where from 3 1/2 to 4 1/2 inch heel) red, purple, polka dot, paisley, strips, shinny, brown, black, blue, orange, pink,....you get the picture. When I came across this little button I just had to post it! I started to love pretty shoes when Dave bought me a pair of red patent leather shoes. They were not just a solid red, no, they started at the tip of the toe in a deep, deep red and then faded back to the heal to a true red. They were gorgeous! Every time I wore them someone would stop me and make a comment. Of course I was absolutely crushed when our new puppy at the time decided to teeth on them! Dave will tell you I cried and cried. I search for days to find a replacement pair but to no avail. 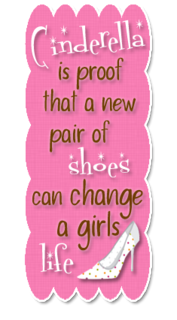 Ever since then I have loved shoes! You could say that, that pair of red shoes changed my life.